James Harris Gallery | "Unexpected Customs: Efrain Almeida, Squeak Carnwath, Claire Cowie, and Akio Takamori"
James Harris Gallery is pleased to present “Unexpected Customs”, a group exhibition featuring painting, sculpture, and works on paper by artists Efrain Almeida, Squeak Carnwath, Claire Cowie, and Akio Takamori. 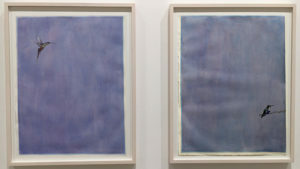 The exhibition was created to demonstrate how artist practices are unique personalized visions; and through composition, and subject matter along with their use of color amplifies an object’s intent. Thus they share in a common custom. This show is also a response to a customs strike in Brazil trapping Efrain Almeida’s work in a state of limbo causing a delay of his solo exhibition until February 2017. The current show is “Unexpected” but through the viewers looking reveals an intensely personal experience created by works of art. Unlike photography, painting is a transcription of human interaction with a surface. Squeak Carnwath’s paintings are ruminations on time, place, and human presence. Her iconography and use of color is a trigger for thoughts, memories and experiences. Through a combination of symbols, shapes and referential objects, Carnwath infuses her paintings with emotion and meaning. 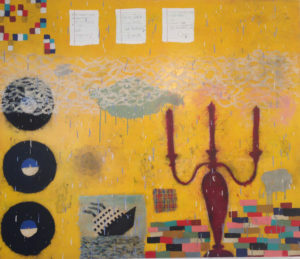 In the Painting “Our Reality,” Carnwath offers saturated colors in the forms of ovals, blocks, and dots combined with her signature vocabulary of records, candelabras, ships and hand written text to convey both bold exuberance and quiet reflection. These disparate forms become symbolic constructions for Carnwath’s meditations on the past, present and future. Drawn into the artist’s world, the viewer jumps or skips across the work into an attempt to piece together an elaborate cryptic narrative which refuses to offer a conclusive ending. Carnwath wants the viewer to make connections between words, objects and shapes; connections that often evoke moments of humor and sadness. Sculpture is the core of Brazilian artist Efrain Almeida practice. Like most sculptors, the artist creates works on paper to explore ideas developed in his three dimension pieces. Almeida lyrically explores issues of sexuality, religion, nature, humanity and personal identity in his work. Hummingbirds have been a recurring an important psychological symbol in his practice for over 15 years. Humming Bird in Portuguese is “Beija Flores” translates to kiss flowers. Birds as a subject hold great meaning in art. They are symbols of freedom, of fragility, and transcendence. In the “Sky,” one hummingbird is depicted in flight while another sits waiting on a branch, their action separated yet united in composition, a fragile suspension of action. The artist purposely builds up the layers of color to create the blue hue of sky. Washes of blue and pink imbue the work with atmosphere and stillness. The detail of each bird appears to float against the minimalist sky. Claire Cowie sees art as a communicative language. Her trademark watercolors and collages explore a personal iconography based on family, friends and experiences. In the past she has turned to sculpture to also depict these themes. In 2015, she created a body of work focusing on the idea of a traveller. In a sense we are all travellers through time. The sculptures reflect the human, fallible process of charting one’s progress and rectifying mistakes along the way. As in her previous work, animals often are stand-ins or foils for human figures. Washes of intense color are intuitively applied to emphasize form are countered by fine lines to articulate details. Each sculpture has its own narrative; placed together they create an open-ended dialogue of the psychology of the mind. 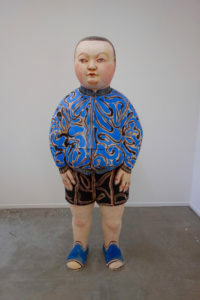 Akio Takamori’s freestanding sculptures investigate the interface between contemporary society and the flux of diverse global cultures that impinge on it. Takamori grew up in Kyushu, Japan and is a seminal figure working in the international ceramic arts for more than 30 years.. Bold form and color defines his body of work, which is highly expressive of human emotion, sensuality and fearless eroticism. He continues to explore the realm of human experience and rational social behavior through figures of youth and old age. Monumental in scale and personality, standing over six feet tall, “Boy” quietly engages the viewer. The sculptures size contradicts the innocence of his gaze. The bright blue jacket articulated with black lines intensifies the volume of form and his youthful appearance. The artist posits important questions about individual history and cultural perceptions. The pieces selected for this exhibition remind us that nothing is static, choices are made and outcomes are determined. “Unexpected Customs” demonstrates personal journeys that we are welcome to join and add to our own experiences. 74" x 28" x 18"